Miss USA Kara McCullough of the District of Columbia speaks during a press conference after the pageant. The Q-and-A session during beauty pageants often is a fraught situation. Contestants are given only about 30 seconds on live television to answer questions about how to stop terrorism or whether America has an immigration problem. In other words, it’s a segment primed to go viral (see: Miss Teen South Carolina’s infamous response in 2007), as any good TV producer would hope. As a result, it’s rare to see anyone answer a question directly. Contestants often spout off media-trained, middle-of-the-road answers that ensure no one will be offended. 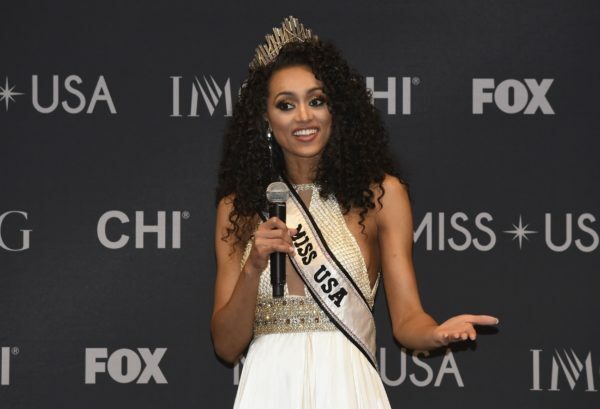 So it was very unusual Sunday night when the new Miss USA — Miss D.C. Kara McCullough, marking the second year in a row that District of Columbia won the pageant — gave a very direct answer about health care, which in turn sparked a debate on social media. Reaction on Twitter was swift — quite a few people were horrified (“Miss DC just lost me with that answer …. Affordable health care is a privilege? Girl bye”; “Miss DC was my fav but … not after that answer”). Others applauded her (“Respect for Miss DC saying that health care is a privilege and not a right”). Some went into broad discussion (“The thing about Miss DC is she’s correct — health care IS still a privilege, not a right. It’s just that that’s what’s wrong with our system”). By the time Miss New Jersey answered the fifth and final question about whether social media is a positive or negative influence in our culture (“With great power comes great responsibility,” she said), it was clear who had the most memorable answer of the night. Later, McCullough also stirred up a similar debate online for her answer on feminism (“As a woman scientist in the government, I’d like to lately transpose the word feminism to equalism”). But as it turns out, a possible controversy doesn’t necessarily matter to the judges — at the end of the night, she was named the winner.